The Bitcoin market is wound up wondering about regulation. Regardless the outcome, BTC is set up to make a big move. The question now is which way will it be and the answer is tied to regulation. The cryptocurrency market faces dubious regulation in most parts of the world although it is generally accepted as well. The problem is that regulators have been hesitant to embrace the new technology, have failed to recognize its importance, and too slow in establishing global standards. The SEC is the primary example of this short-coming. The US regulator has long been on the fence at once taking on the task of regulation and then doing little about it. So far we’ve seen a few enforcement actions and a couple of court precedents but nothing in the way of true regulation, regulation that will facilitate public access to the world’s fastest growing market. One of many reasons the market wants regulation is so US securities markets can list Bitcoin ETFs and ETFs based on cryptocurrency technology. Another is so businesses can begin using digital technologies to raise money (ICOs) and list other types of block-chain based securities. In all likelihood, once the US regulators embrace blockchain for what it is, we will see jurisdiction divided between the CFTC for commodity like tokens (BTC, ETH, LTC) and the SEC for everything else. On the plus side, there is a growing movement within the cryptocurrency and investment industry to get digital assets regulated. A group of leaders from both arena’s joined together in approaching Congress on the subject. The meeting resulted in a Congressional request for clarification on cryptocurrency regulation. As yet there is no response but it seems certain regulation is the on the way, perhaps this event will help spur it along. Where is BTC now? Wound up like I said, trading within a tight and narrowing range. Support within this range is strong, it is near the $6,000 level which has been tested and retested many times over the past year. 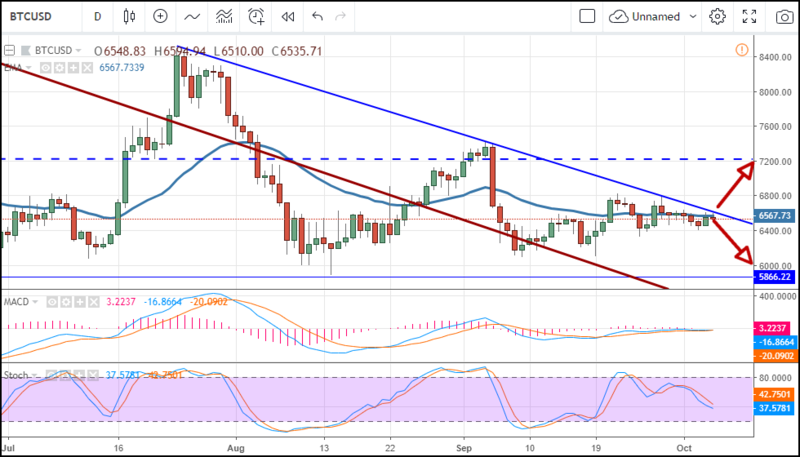 Resistance is the top of a down-trending price-channel just above $6,600 and is reinforced by the short-term moving average. If no catalyst emerges to drive prices higher a drop to the bottom of the range, at least as far as the $6,000 support level, is likely. If a catalyst does emerge, if prices break out of the channel, a move to $6,800 is possible. A move above $6,800, if supported by positive news, could take the token up to $8,400 but that’s a big if.